Falvey Memorial Library Open House, First Floor Lounge, 12:00-3:00 p.m. Stress Relief Event: Pals for Life Visit, Room 205, 9:00-6:00 p.m.
Study Break with the Provost, Reading Room Lobby, 3:00-4:00 p.m.
Center for Speaking and Presentation, Room 214, 7:00-11:00 p.m.
Library Technology Developer Presentation and Meetings, Room 301 and 214, 9:00-1:30 p.m.
Learning Support Services: Test Proctoring, Room 205, 8:00-5:00 p.m.
Library Technology Developer Presentation and Meetings, Room 301 and Room 214, 9:00-1:30 p.m.
#FalveyPeek at the Week provided by Hunter Vay Houtzer, a graduate assistant on the Communication and Marketing Dept. at the Falvey Memorial Library. She is working toward an MA in Communication at Villanova University. 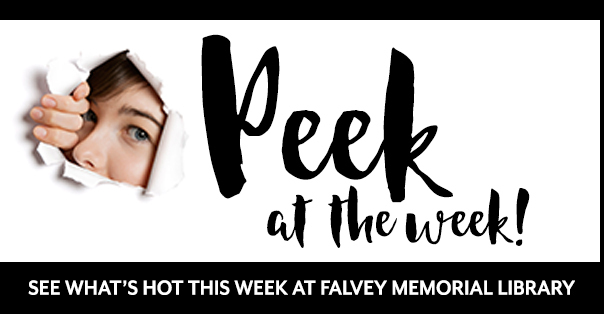 Send your thoughts/suggestions to Hunter at #falveypeek. See you next Monday for more!